If you’re looking for an awesome salad recipe, look no further! 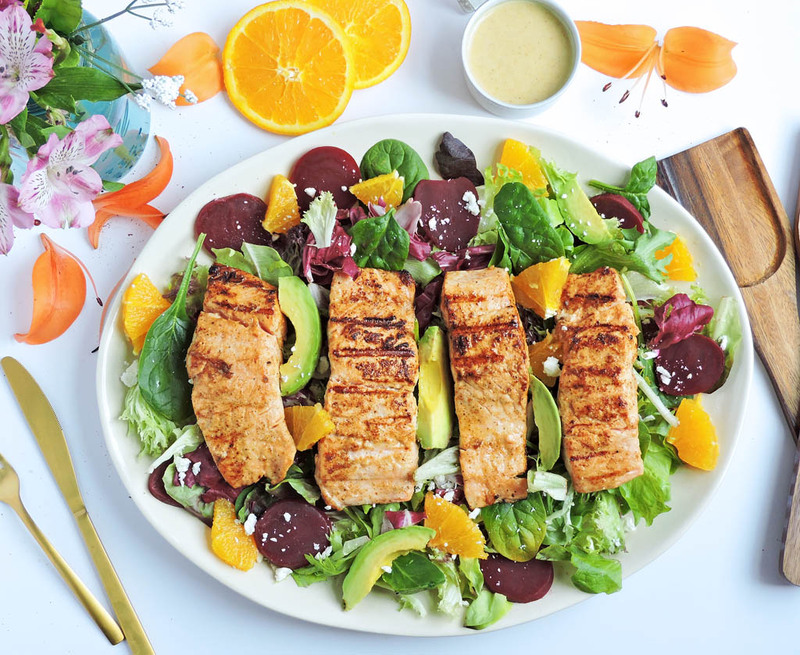 This Citrus Salmon and Beet Salad is light, delicious, and topped with a Dijon Citrus Vinaigrette that will make your taste buds extremely happy! When the warm weather comes rolling in, I suddenly get a hankering for a nice, crisp salad! I can’t explain it, but salads just seem to taste better in the Spring and Summer time! Is that completely weird to feel that way?? Lol! Maybe it’s because I like to add colorful, ‘Springy” produce to my salads! 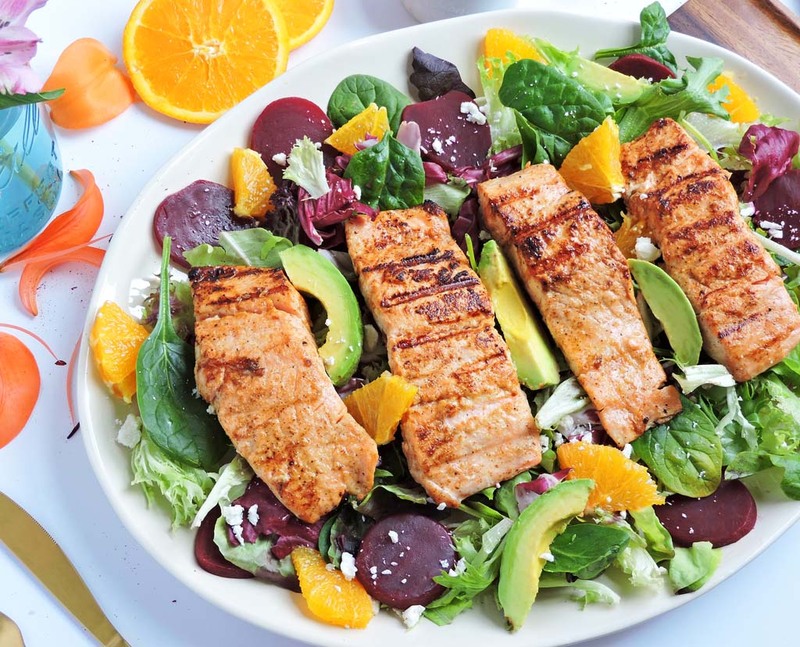 This Citrus Salmon and Beet Salad is seriously my favorite salad! 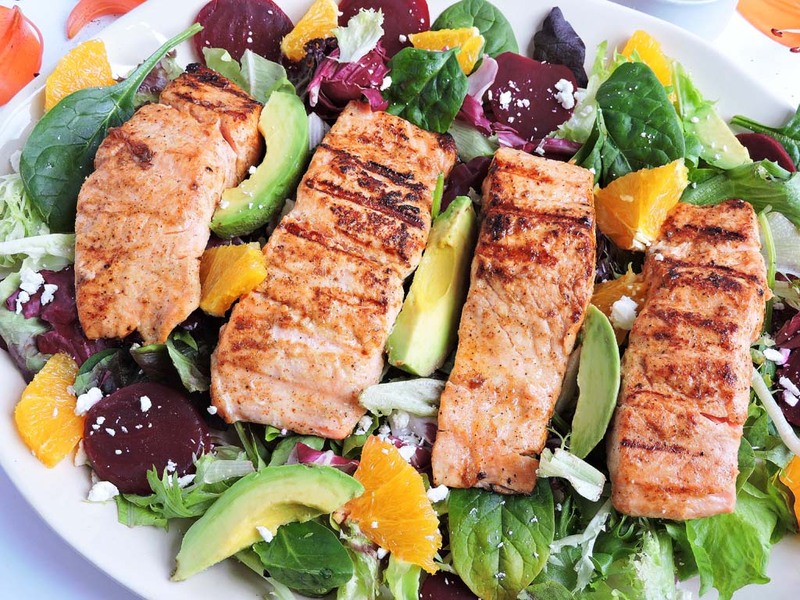 I love salmon, but combining it with the beets, oranges, and avocado made me love it even more! I’m not really a beet-eater, but it really complimented the citrusy flavors in this salad! And can we talk about this Dijon Citrus Vinaigrette!! 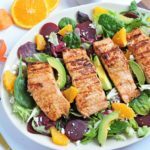 Besides being extremely easy to make and the perfect topping to this Citrus Salmon and Beet Salad, I used it as my marinade! I covered the salmon with this vinaigrette and let it sit for a few minutes to soak in all of those flavors! I seared the salmon on my grill for a few minutes until it was done to my liking. I placed it on top of my prepared salad and topped it with that yummy vinaigrette and a little feta! My whole family enjoyed this Citrus Salmon and Beet Salad, and that’s rare! Lol! Be sure to follow me on Pinterest for tons of healthy recipe inspiration! Start off by making the Dijon Citrus Vinaigrette. Whisk together olive oil, red wine vinegar, Dijon mustard, honey, and fresh orange juice. Or you can add these ingredients to a blender. Season with salt and pepper to taste, set aside. Season salmon with salt/pepper. Spoon 1 tbsp of Dijon Citrus Vinaigrette over each piece of salmon. Let salmon sit for about 5 min. On a large platter, arrange Spring salad mix, beets, avocado and oranges on a platter. Set aside. Add oil to stove-top grill and heat grill to medium heat. Cook salmon for about 3-5 minutes on each side, or until desired doneness is reached. Place salmon on top of salad and sprinkle with feta, if desired. Serve with Dijon Citrus Vinaigrette and Enjoy!